The review you are about to read is for a tale so dreadful that the average reader might wish to stop reading now and open another tab…just kidding. This weekend brought forth yet another Friday the 13th event, an infamous date where one might encounter bad luck and or a series of unfortunate events. In fact this Friday the 13th brought about just that, as the new Netflix series based on the popular children’s book series A Series of Unfortunate Events premiered on this date. Daniel Handler’s popular book (and now television) series tells the story of three siblings: Violet, Klaus, and Sunny Baudelaire, who tragically lose their parents and home in a mysterious fire. Adhering to their parents’ wishes, the children are sent to live with their closest living relative, the scheming Count Olaf; whose true agenda is to uncover a way to steal the Baudelaires’ massive inheritance. This is the second filmed adaptation of the book series, the first being a 2004 film starring Jim Carrey as the sinister eccentric Count. The first season is divided into 4 arcs that each adapt the first four books in the series: The Bad Beginning, The Reptile Room, The Wide Window, and The Miserable Mill. As a fan of the books and the original film, I gleamed with delight when Lemony Snicket appeared onscreen to both welcome us and tell us to turn away for fear of experiencing the depressing story about to unfold. Snicket serves as the shows narrator and is played with such elegance and mystery by Patrick Warburton that he often reminds us of Rod Serling’s role in The Twilight Zone. He introduces us to the Baudelaire children on a grimey sea shore where they are visited by banker and family friend, Mr. Poe (K. Todd Freeman). Mr. Poe informs the children of their parents’ untimely passing and arranges for them to be put in the care of the immensely untalented stage actor, Count Olaf, completely oblivious to Olaf’s vile nature. Count Olaf is played by stage and screen star, Neil Patrick Harris of How I Met Your Mother. At first, Harris’ portrayal of the character comes off as a bit awkward. Even in his more violent scenes with the children he seems to play things a little too over the top and tries to be funny while he’s doing it. However, by the third episode he seems to have grown more into the role and becomes a bit ghastlier. The Baudelaire children, played effortlessly by Malina Weissman (Violet), Louis Hynes (Klaus) and Presley Smith (Sunny) are the true beam of light in this dark tale. Each child is very intelligent and has their own special skill. Violet is a talented inventor who can build virtually any device with the simplest of objects. Klaus is a vivacious reader and is often more knowledgeable than the adults in the series. Sunny, the infant that only speaks in gibberish but is clearly understood by her siblings, is blessed with very sharp teeth that can bite through virtually anything. The series follows the same structure as the books in the sense that the orphans are constantly on the move from guardian to guardian as Count Olaf continuously follows them in different disguises with a new plot to obtain the Baudelaire fortune. Fans of the original book series will be happy to know that the real Lemony Snicket himself (Daniel Handler) has written all but two of the episodes, keeping the plot very close to the source material and even adding in references to more modern technology such as streaming television (Can you say “Netflix plug”?). 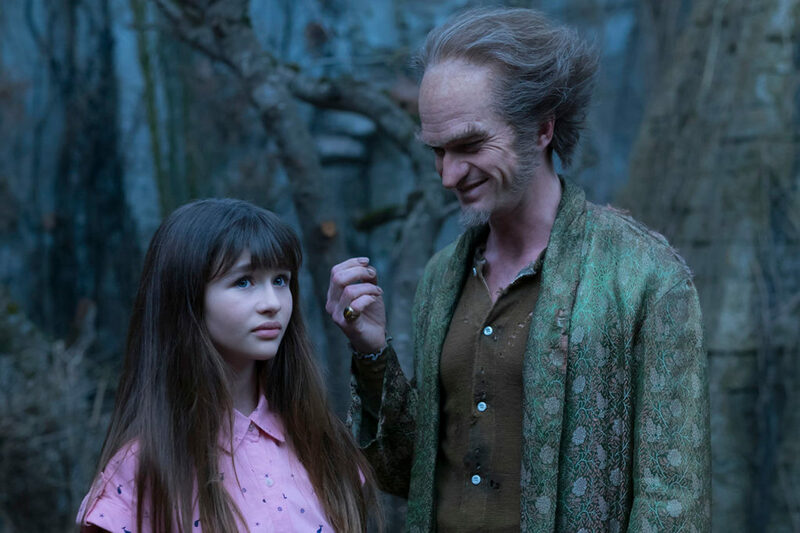 Overall, while A Series of Unfortunate Events can be a little awkward and over the top at times, I would still call it a genuine adaptation with stellar performances and direction. See it.